I love almost everything about the fall. The change in weather allowing you to put cozy sweaters on, wearing boots with just about every outfit, apple picking, baking with said apples, and seeing the trees change all sorts of beautiful colors. There is actually only one thing I don't enjoy about the fall, and that's the fading of the tan that took all summer to perfect. Yes, I have been looking in the mirror the past couple of days only to have a pale refection starting back at me. So I decided it's time to try some self tanner. In the past I have found two that I have been happy with. The first being L'Oreal Paris Sublime Bronze Self Tanning Lotion and the second being Tan Towel Self-Tan Towelettes. Both of these products left me with a bronzed glow that wasn't too orangy, but the smell always seemed to bother me. Although the scent of self tanner was faint, and I am the only person who probably could smell it, it still daunted me that is was there. After doing a search of top rated self tanners I decided to try St. Tropez Gradual Tan. I have only heard good things about the brand and am excited to give it a test run. Today was my first application and I have to say I am very impressed with the smell. There isn't a hint of that self tanner scent but instead a pretty lotion aroma. I will use it over the next week and update you with my review. 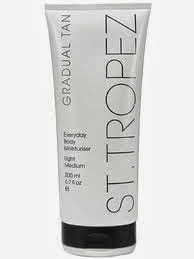 In the meantime, if you have used St. Tropez Gradual Tan, please tell me what you think. Did I make the right self tanning choice?